Last year, I lined up for this event, and it was my second marathon. 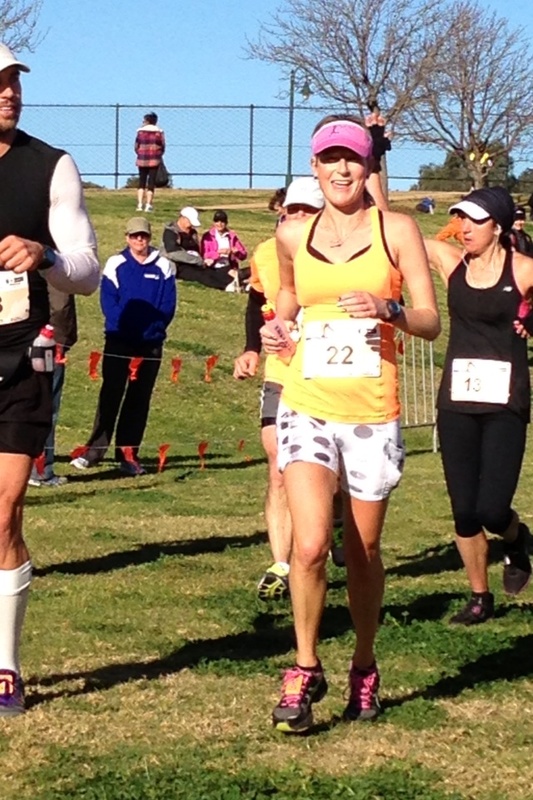 This year, the Hunter Valley Marathon was held again on Sunday 21st July. I had only decided to enter 6 days earlier. It was my 10th. It was also my second marathon in 2 weeks. I hit the snooze button a few too many times, and as a result I didn’t have much time to get ready. I couldn’t find the bodyglide, and had no time to eat breakfast before I left home at 5am: I’d have to eat in the car. 1 packet of breakfat biscuits, a banana, and half an energy bar. I picked up Mum and Dad on the way, and headed out to the vineyards. It was a much nicer day than last year. Clear skies, chilly breeze, at least there was no rain. The race briefing seemed to go on for half an hour. Finally, at 7.07 am, around 130 of us were on our way. I was glad to be moving instead of standing in the cold. This was going to be a bit of an experiment for me. It had only been 2 weeks since I had done the Gold Coast Marathon. I had no idea how my legs would hold out. I was hoping I would be able to hold 5:40 per kilometre pace, which would get me to the finish line in close to 4 hours. But I was prepared for failure, so much so that I had only told a few people I planned on doing this event. I would also be running without my water belt for the first time, and drinking only off water stations. l was not wearing calf sleeves either. A few kilometres in, I was feeling good. But then came ‘the hill’. 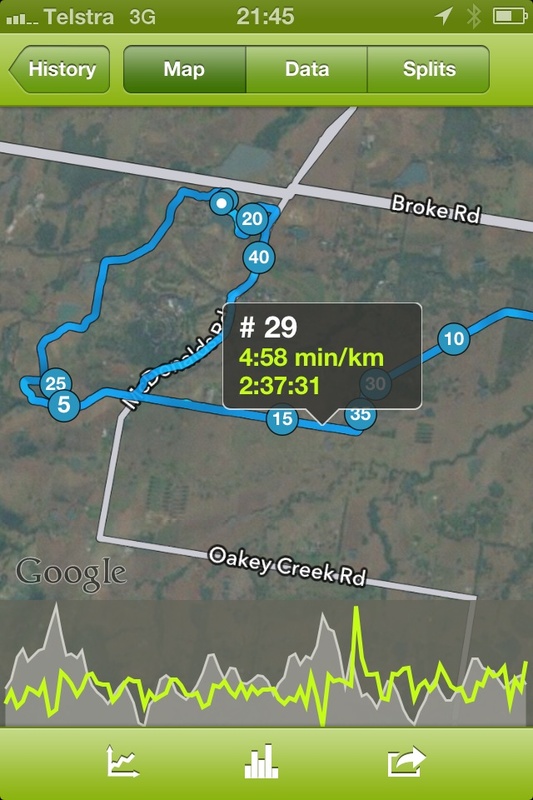 It is a reasonably hilly marathon course, but there is only one hill that bothers me: located about 4 km in. 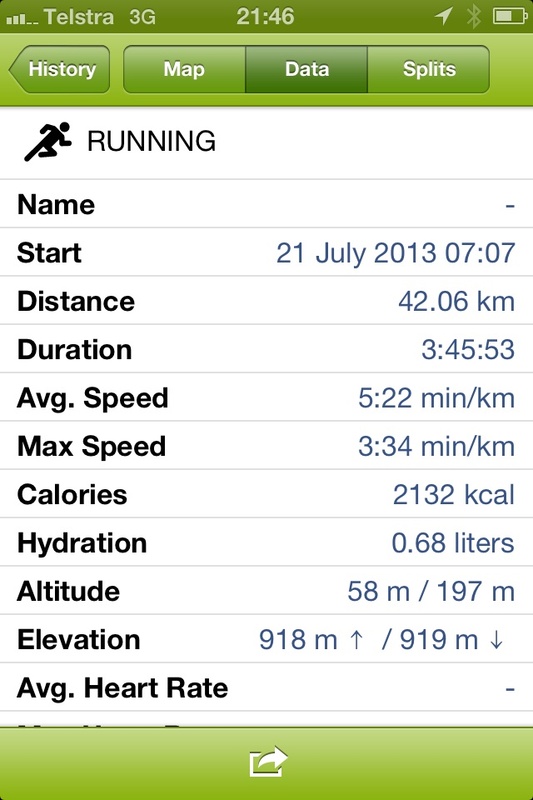 Last year, it nearly broke me second time around (the marathon course is 2 laps of the 21.1km half marathon course.) This year, I knew what to expect. I don’t think it gets easier, but we get better. I got up the hill without too much trouble, first time round. I found myself running in a group of 4 or 5 runners, and we stayed together for most of the first lap of the race. This was great, because with only 130 people in the race, it can get lonely out there. I think I did most of the talking though. Running without my belt was going OK. I did choke a little at nearly every water station, and struggled to get my gels down quickly. I tried to slowly sip my water as I ran along, and always finished my cup long after passing the bin at the end of the station. Then I felt bad for throwing it on the ground. I think I need to volunteer at a marathon soon, to make up for all the cups I have dropped. Kilometre 6: 5 minutes 14 seconds. Kilometre 7: 5 minutes 7 seconds. Kilometre 8: 5 minutes 11 seconds. Too Fast!! But I was feeling good. Running and chatting made it seem easier. I was running faster than I thought I would be. As I ran back towards Hunter Valley Gardens to complete my first lap, I spotted my running buddy Pip, dressed in Pink and hard to miss. She was cheering loudly and snapping pics. Then I saw Mum and Dad, and it was time to lose the arm warmers! I pulled them off and tossed them to Dad. We ran around the oval, and completed the first lap in 1:54:26. There was a table just past halfway where we were allowed to leave our ‘special needs’. I grabbed my mini waterbottle, with 2 gels sticky-taped to it, and headed out for lap 2. Time to do it all over again. Second time around, the hill really separates the milk from the cream. Our little group of runners was no more. Partway up the hill, I looked up, to see every single ‘runner’ become a walker. I was determined not to break into a walk. I thought back to my recent blog post, “The Rules of Running”, particularly rule #14: Look at hills as an opportunity to pass other people. And pass I did. About 10 people, on one hill. On the other side of the hill, I heard heavy footsteps behind me. they would become the footsteps that would run near me for most of the rest of the race. First behind me, then alongside me, then in front of me. They belonged to a man named Ray. He was a man of few words, but what he did say was very interesting: Ray had run 159 marathons. Including a few 100-milers, to keep it interesting. This reaffirmed to me that I am not crazy. 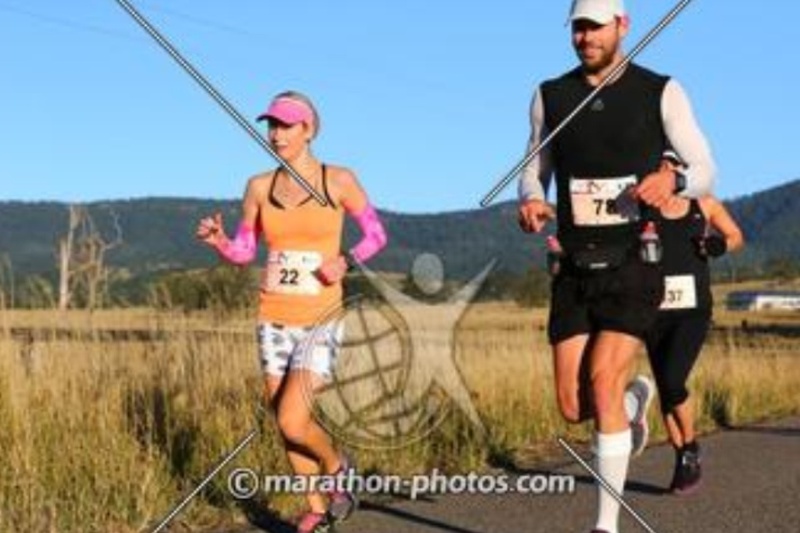 Or perhaps I am crazy, but at least I’m not alone in trying to run 10 marathons in 1 year. I asked Ray if there were any highlights, hoping he might be able to add a couple of races to my must-do list. His answer was, ‘I ran sub 3-hours when I was 60’. Incredible! Another gem that Ray shared with me: Consistency is key. Don’t run too fast, just run consistently, and you will pass many people on the hills and in the last few kilometres of the marathon. Running with Ray, the 159-time marathon champ! As made it to the turnaround for the second time and headed for home, I was met with a pretty nasty headwind. it blew on and off for the last 10km of the race. At around the 36km mark, I was running downhill, but the wind was blowing so hard, it felt like I was running uphill. Into a brick wall. 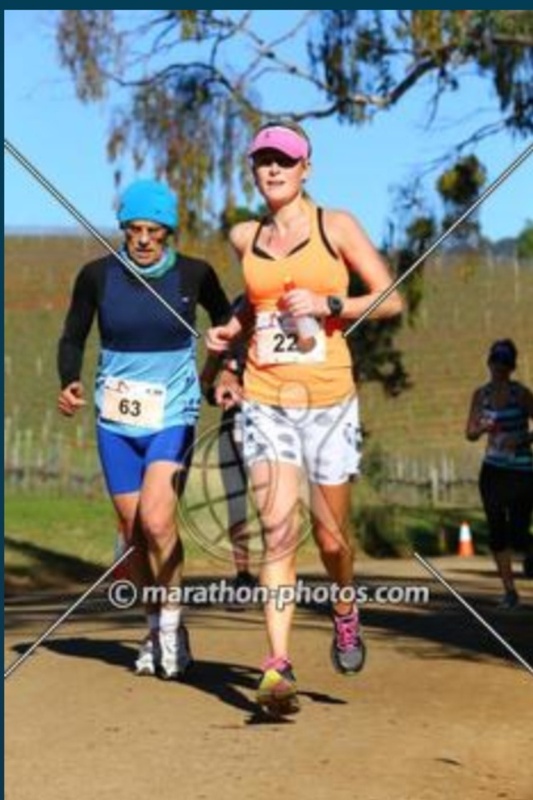 At the finish line, I also spotted the guy that I saw at the Macleay River Marathon…. The one wearing the ‘I’m doing 10 marathons in 2013’ singlet. Once again, I did not get to talk to him, but I’m going to look out for him at my next marathon! I’m not sure If losing the water belt was a good move either. What I gain in being a kilo lighter, I lose in slowing down at drink stations, choking down my water, and having the placement of the water stations dictate when I take my gels. In the future, I think the belt is a good option for me. 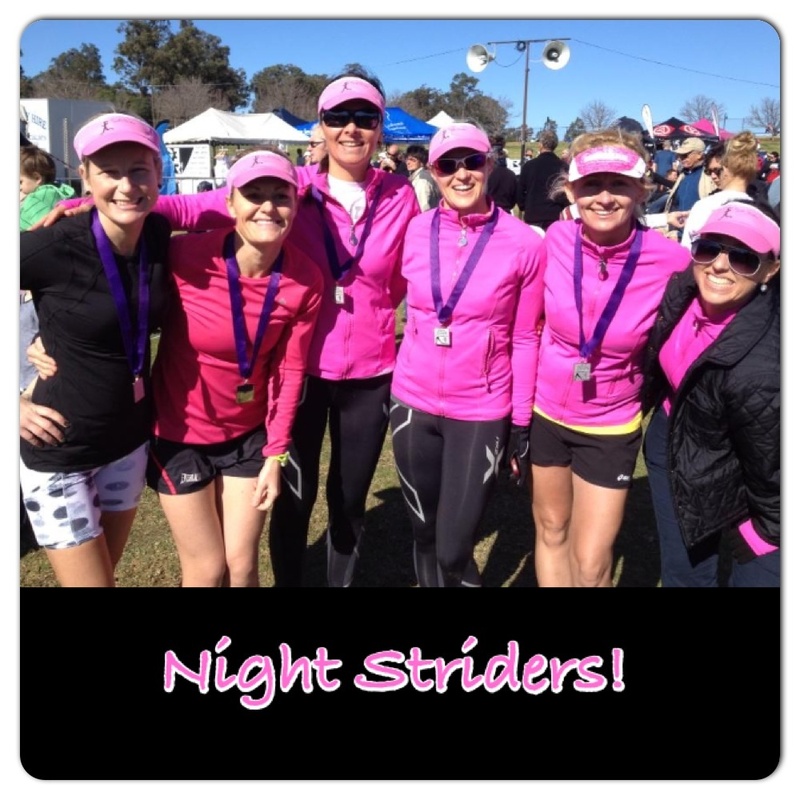 Hanging out with the Night Striders after the Race. Photo Credit: Matthew Roberts. Thanks to Pip for being my personal cheer squad and photographer extroardinare, Mum and Dad, Matty, Hayley and the other half-marathoners for your mid-run cheers, and all of the Night Striders for all the love and support! OK, maybe the course had more hills than I thought! This is represented by the grey graph at the bottom. the green line is my speed… Going down as the hills go up! Loved the reading and excitment! Thankyou Gail, glad you liked it! Sad Michael could not be there this year, he was a great support last year! Well done! Great goal of 10 marathons in 2013. My goal for the year is 13 Halves and Fulls combined. Looks like it will be 4 Fulls, 9 Halves for me. Keep running! When is your next race? That’s a great goal too, good luck with it! My next race is possibly this weekend…. Going to attempt a 1 week turnaround, I’m scared! But I feel good after Hunter Valley, just a little tight in the hip flexors. 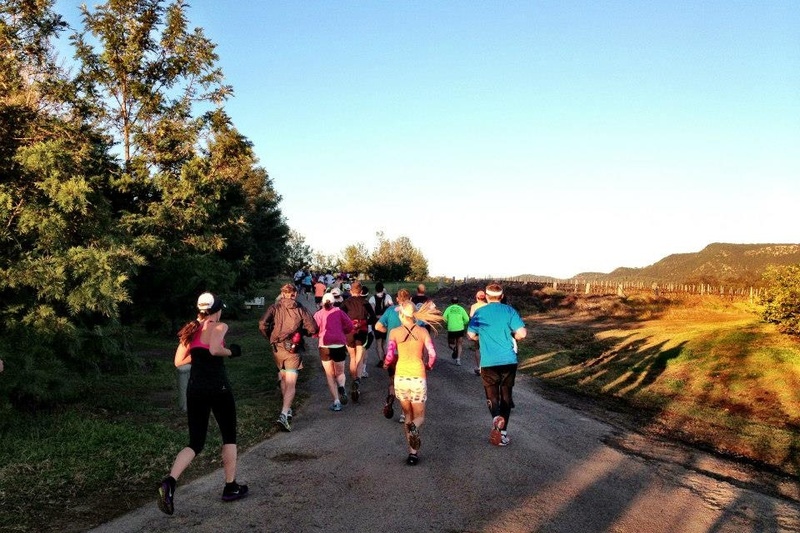 It is a 43km trail run, around Bobbin Head, North Sydney. I’m very interested in reading about others who run multiple races in a short period of time, and what they do to help recovery! I’ve done Half then Full twice less than a week apart. I may be attempting a back to back Half/Full in two days in October. Im glad to know Im not the only one who thinks this is possible! I would love to do the disleyland/disneyworld?? One where you do the half, then the full the next day. All in one day? One weekend? That sounds like a challenge! I love reading your blogs! I had the privilege of watching you run over the finish line on Sunday and I have to say you are an inspiration! I love being a part of the Night Striders for this very reason. I hope to complete my first Half Marathon this year and my first Marathon next year and reading you blogs only inspires me more – thanks Kirby! Inspirational and informative read Kirby. Well done on your fabulous achievement. Im doing Melbourne this year too! It is a great choice for a debut marathon, well organized, good course, and you finish in the MCG! Good luck, and let us know how you go!